Way back when I was dating Chris, I was going through a major country music phase…and I do mean major. I had the boots, I had the cowboy hat – I even had a custom-made leather belt with my name in silver letters across the back and a coordinating belt buckle. To say that I spent my fair share of time in the bars on country music night would be an understatement! I used to attend many a concert, with one of my favorite country music singers being Brad Paisley – what a voice on that guy, am I right? While Brad Paisley has released a ton of albums since then, my favorite song of his is still That’s Love. When I think of Brad Paisley, I still think of That’s Love, Celebrity and the like from the first time I saw him in concert; he was so charming and you could tell that he just really loved country music! That’s what I love most about him, he seems like such a positive, happy guy and that really comes across in his music. 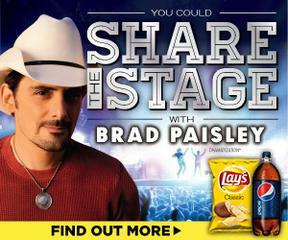 If you’re a big Brad Paisley fan too, then you really must enter the Dollar General “Share the Stage” Sweepstakes! To enter for a chance to Share the Stage with Brad Paisley, all you need to do is buy a 9.5 oz. or larger bag of Lay’s chips & any Pepsi-Cola (1.5 liter or larger or multipack) in a single purchase now through June 23rd, 2013. When you get home, just enter your receipt code at www.dollargeneral.com. 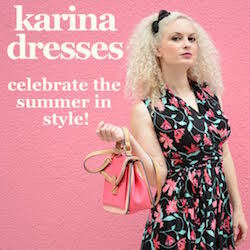 Make sure that you enter your code by the June 23rd deadline at 11:59 pm CT for a valid entry! And guess what? Even if you don’t win the opportunity to share the stage with Brad Paisley, you still win because everyone that enters their receipt code wins a free song download! Plus, there’s the great savings on Lay’s and Pepsi-Cola products that you’ll get at Dollar General stores! We have a brand new Dollar General not too far from us in Miami and I like stopping in to stock up on household supplies and goodies because their prices are usually lower than at the grocery stores. With summer vacation right around the corner, now is the time to fill your pantry with snacks, right? It’s a win-win: your family can have Lay’s and Pepsi-Cola in the kitchen for a special summertime snack and you can enter to win the opportunity to share the stage with Brad Paisley…all while saving money by shopping at Dollar General!